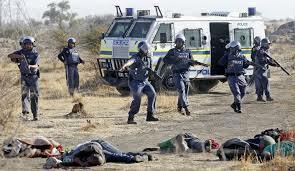 Nearly three years after the massacre of mineworkers at Lonmin’s Marikana platinum mine in South Africa, people are still waiting to read the report of an inquiry into the outrage. President Zuma appears to be sitting on the report – and both Lonmin’s CEO and mine workers are demanding that the report’s findings now be released. Meanwhile, controversy continues over allegations that Lonmin has creamed off profits to Bermuda rather than pay more tax in South Africa. All this trouble has caused the company’s value to nose-dive – and London-listed mining company Glencore, with a massive shareholding in the companu, has decided to disinvest. And there is yet more trouble ahead for the company – unions have declared they will fight job cuts in the mining industry – with Lonmin one of their targets.